Entryways for government buildings are large in scope and can range from simple to ornate. Stromberg uses molds to produce their glass fiber reinforced concrete (GFRC) entryways, which means they can manufacture one for you in any shape or size. A Stromberg entryway in GFRC will have a sense of the timeless and evoke the rich tradition of all government; it can be made to look like natural stone such as terra cotta or limestone, but at much less cost. The experts at Stromberg Architectural have even worked on the White House entryway, so they understand how to produce enduring quality suitable for your government entryway. 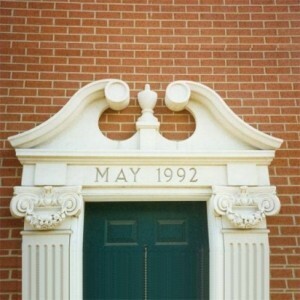 GFRC entryways for your government building can be inscribed with dates, quotes and slogans and the entryway itself can be made in just about any style. Since GFRC is reinforced with fiberglass it weighs less than pre-cast concrete, so the size of your entryway isn’t an issue. 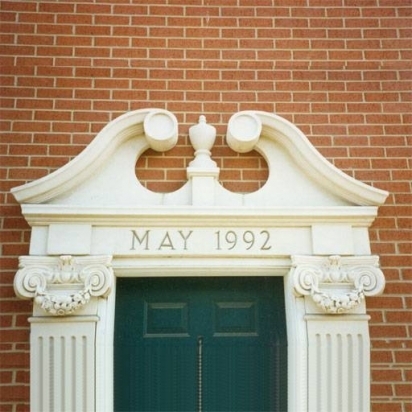 Stromberg also makes columns as well as a wide array of architectural elements in GFRC to support the entryway to your government building and add a touch of the classical. Glass fiber reinforced concrete (GFRC), is moisture resistant, won’t crack and is fire resistant; all important features for a government entryway. GFRC can also be painted in a color that will match the surrounding building. Stromberg can create complex or simple detail for your entryway, including historical detail, geometric design, exciting angles and curves as well. Stromberg pioneered the use of GFRC and are experts in its use. Stromberg has also completed historic restoration on government entryway projects like the Texas State Capitol. They can offer you preconstruction assistance with costing, design details and art direction, among other services that will make the job go smoothly. Also offered are budget estimates, samples and mock ups and material development. Glass fiber reinforced concrete comes in a wide variety of textures, colors and stains. GFRC is an earth-friendly and long-lasting substance. GFRC weighs 80-95% less than concrete. GFRC is lightweight yet very durable. The professionals at Stromberg Architectural Products will work very closely with you on your project until it’s completed to your satisfaction. They will help with CAD details, design assistance and all specifications. Contact them today at (903) 454-0904 and put their 30 years of experience to work for you.